Zinc oxide is a non-corrosive alloy commonly used to galvanize steel. The end result is a protective layer that is resistant to both salt and water, and virtually maintenance-free. Galvanized steel is used extensively in the manufacture of marine parts, steel building structures, and outdoor playground equipment. In this demonstration, 2 galvanized steel plates are joined using Super Alloy 1 and a propane torch. 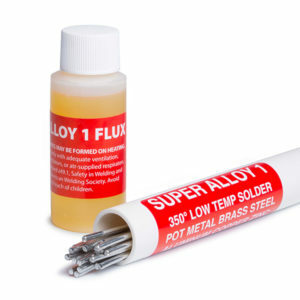 The low melting point of Super Alloy 1 is ideal for soldering without damaging the protective zinc coating.